Reverse Osmosis Ultraviolet Sterilizer Water Filter System UV RO 6 Stage 100 GPD. Powerful High Quality 6 Stage RO Water Filtration System. 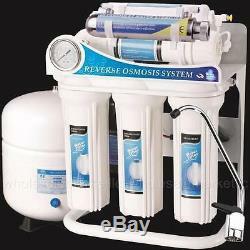 High Flow 100GPD (Gallon per Day) 6 Stage Reverse Osmosis Drinking Water System. This RO system has an UV light which is e.
Xcellent to kill harmful Bacteria, E Coli, Viruses Fungi, Algae. The other stages remove Chlorine, P. Benzene and many volatile organic compounds. Sediment, Bad Taste and Odors. Effectively eliminates many impurities from tap water to offer sparkling clean and great tasting water. Produce up to 100 gallons of top quality water per day. Remove up to 99% of undesirable contaminants found in tap and well water. Filters particles as small as 1/1000 of a micron. Most recommended water filtration system by doctors, dietitions, and 1000s of happy homeowners. Comes with color coded tubing for easy installation. Complete System with all installation hardware. 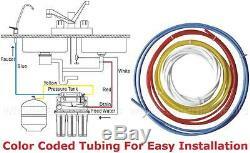 Includes filters, faucet, holding tank, tubing, housing wrench and all installation hardware. This unit also has Quick Connect Fittings and an Installation Manual for easy installation. Uses Standard 110V Outlet for UV Purifier. We use high capacity filters, you only need to replace the post filters once a year instead of every 6 months. Standard size filters 2.5x 9.75. Standard Size 2.5x 9.75 Sediment Filter. Such as silt, sand, rust, dirt, and other undissolved. Standard Size 2.5x 9.75. Adsorbs and removes bad taste and odors. Also a large variety of organic contaminants such as chlorine and chemicals linked to cancer, like pesticides, herbicides, insecticides. Benzene and many volatile organic compounds such as VOC's, PCB's, MTBE's along with hundreds of other chemicals and contaminants that may be present in our water. Removes chlorine, bad taste and odor, organic solvents and organic chemicals that contribute to bad taste and odor. High Flow 100 GPD (100 Gallon per Day) Reverse Osmosis Membrane. Removes and filters particles as small as 1/10,000 of a micron and most inorganic chemicals (such as salts, metals, minerals). Also most microorganisms including cryptosporidium and giardia, and many other inorganic contaminants. And refines for a sweeter tasting water. Removes any tastes or odors the. Water may have picked up while sitting in the storage tank. Harmful Bacteria, E Coli, Viruses Fungi, Algae most microorganisms including cryptosporidium and giardia, and many other contaminants. We do not guarantee this time frame, however, every effort is made to respect it. Requests for specific carriers may require additional charges. Thanks for shopping with us! The item "Reverse Osmosis Ultraviolet Sterilizer Water Filter System UV RO 6 Stage 100 GPD" is in sale since Wednesday, October 18, 2017. This item is in the category "Home & Garden\Kitchen, Dining & Bar\Small Kitchen Appliances\Water Purification\Water Filters". The seller is "wholesalemarketllc" and is located in Missouri. This item can be shipped to United States, Canada, United Kingdom, Denmark, Romania, Slovakia, Bulgaria, Czech republic, Finland, Hungary, Latvia, Lithuania, Malta, Estonia, Australia, Greece, Portugal, Cyprus, Slovenia, Japan, China, Sweden, South Korea, Indonesia, Taiwan, South africa, Thailand, Belgium, France, Hong Kong, Ireland, Netherlands, Poland, Spain, Italy, Germany, Austria, Israel, Mexico, New Zealand, Philippines, Singapore, Switzerland, Norway, Saudi arabia, Ukraine, United arab emirates, Qatar, Kuwait, Bahrain, Croatia, Malaysia, Brazil, Chile, Colombia, Costa rica, Dominican republic, Panama, Trinidad and tobago, Guatemala, El salvador, Honduras, Jamaica.